Why A Divinely-Elected Imam Now? The main reason for the arrival of new non-Law-bearing prophets in the Muhammadan Ummah (pbuh) is that Islam came for the whole world and must be propagated. 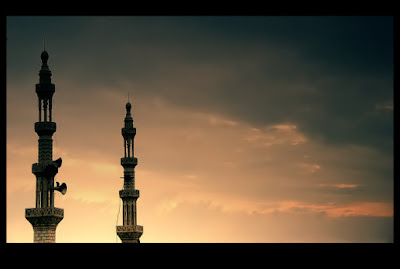 And for this important work two arrangements are necessary: first the internal reform among Muslims (i.e., the strengthening of their faith in Islam), and second, the spread of Islam around the world. These two needs cannot be achieved without strict discipline, a leader, an Imam. “Allah would not leave the believers in that (state) you are in (presently) until He separates the evil from the good. Nor would Allah reveal to you the unseen. 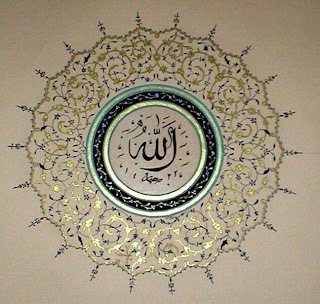 But (instead), Allah chooses of His messengers whom He wills, so believe in Allah and His messengers. And if you believe and fear Him, then for you is a great reward.” (3:180). On the other hand, if there should not come a prophet, why did Allah (swt) say to those who believe in Hazrat Muhammad (pbuh) that a time will come when there will be no difference between good and evil and that He shall then send a prophet? Why did He give the command to believe in the Prophet and to fear (i.e., to reform)? There is in all this food for thought. O Muslims! Remember that we are the promised children of Abraham (as). There are great promises of God concerning us. God has made us the best of all (Khairi Uman). He gave us until the end of days the development of temporal favours in the form of royalty and also the development of spiritual favours in the form of prophethood, for we are the seed of Abraham (Ibrahim). God had kept His promise to Abraham’s posterity from the branch of Israel (Jacob / Yaqub) as long as they did not become evil, and thus the system of royalty and that of prophethood were reserved for him. But when they became wicked, God changed the trajectory of His Light and (while still holding firm to His promise to Abraham) gave that favour to the posterity of Ismail where we had the Rahmatul-lil-Aalameen (blessing for the entire universe) to bless all nations and whose coming was promised as a manifestation of God. This awaited perfect messenger was indeed the seal of the prophets, the founder of Islam, our beloved prophet Muhammad (pbuh) who came with a perfect divine book, i.e. the Holy Quran. There is no nation but has had its Warner. As Allah (swt) is the Lord of all mankind, He has equipped all humans with the power to think for themselves. And thus, He could not deprive any nation of His guidance. Like the verse of the Holy Quran which I have recited before you, in which it is said: “There is no nation but has had its Warner”. Allah (swt) has sent His messengers among all nations and in all ages, and like the sun lights up the whole world, the light of revelations has ever lit up the darkest corners of the earth. If today we cannot discover the light of revelation among a particular people, it does not mean that no prophets have appeared among them, but the truth is that these people have allowed their national traditions and faith to die out. Over time, most people believed that (divine) revelation was limited to the founders of their respective religions, and even those who believed that divine revelation was given to those who profess other religions did that, more like a kind of personal tribute to the founders of these religions because of the services they had rendered to the cause of humanity than the result of the acceptance of the doctrine of the universal providence of God. For example, today we see that Christmas has become a national and international festival where even the adherents of other religions like the Hindus celebrate it with fanfare. Why? Is it because of their belief in Jesus just like the Christians have in him? Or is it simply because of the attraction of this festive celebration and as a tribute to the Christian beliefs about Jesus’ birth? They are fully engaged in this feast while in reality they do not believe in the authenticity of Jesus as a prophet, or even (may Allah forbid) as son of God, a belief that the majority of Christians espouse. The services rendered to humanity by the righteous servants of God have certainly been preserved in history, but God’s attributes and words also reflect the fact that each nation, whether its traditions have been preserved or not, had its prophet and to receive guidance through prophets is the right of humanity that God never ignores. This doctrine has opened for all nations the doors of God’s love to the point that it has put the internal relations of humanity on a consistent and friendly basis and preserved the founders and righteous men of all religions from all kinds of insults. The world has seen the greatest universal prophet for all humanity, for all nations, for all peoples of the world. This greatest prophet is indeed our beloved prophet Hazrat Muhammad (pbuh). 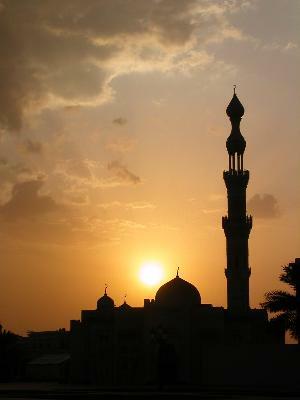 He was raised among the Arabs as the universal prophet for the entire human race. Although he was the last prophet bearer of divine laws, with the last code of revealed laws, i.e., the Quran, the complete Holy Book, which contains the necessary lessons for the needs of all times, the doors of revelation and spiritual advancement are, however, still open and will continue to be forever. 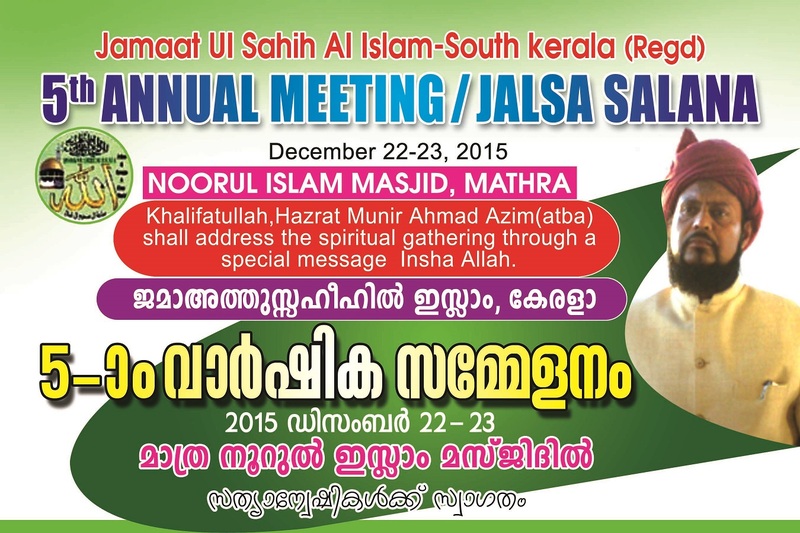 Jamaat Ul Sahih Al Islam Kerala organized its Fifth Jalsa Salana at Noor'ul Islam Masjid, Mathra, 22-23 December 2015, Alhamdulillah. 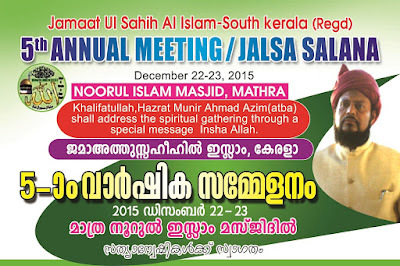 Brothers from Alappuzha and also from Delhi, reached ahead of the commencement of the two-day programme. Members listened to speeches and engaged in extended conversations, discussing the finer points of being a believer in these difficult times where the world around us is largely indifferent to Tawheed and all that it entails in our private lives and public conduct. As a community of people with shared interests and concerns, common goals under the banner of Jamaat Ul Sahih Al Islam and the Imamat of the Khalifatullah Hadhrat Munir Ahmad Azim Sahib (atba) of Mauritius, the brothers and sisters viewed the get-together as an opportunity for soul-searching and critical self-reflection. On the first day, all brothers and sisters collectively offered the Tahajjud prayers and it was followed later by the Namaz-e-Fajr. 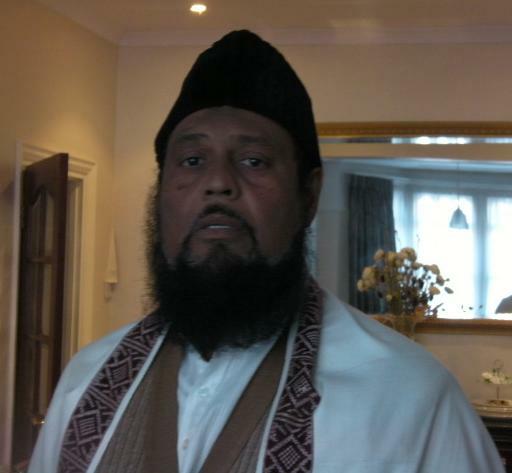 Mukarram Amir Jamaluddin Sahib conducted a Dars-e-Qur’an, immediately after the Fajr Namaz. 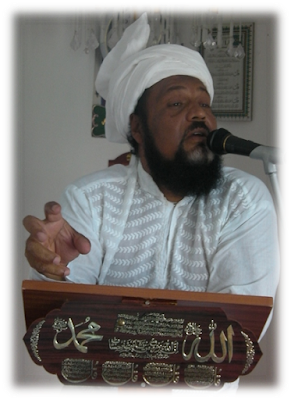 In his speech, the Amir Sahib pointed to the subtle verities of spiritual wisdom contained in Surah Al Asr. Firm belief, enduring good deeds, patience and steadfastness against all odds--- mark the charcater of all true and sincere believers in every age, reminded the Amir Sahib in his sermon. At 9.00 a.m, all members assembled for a new session. 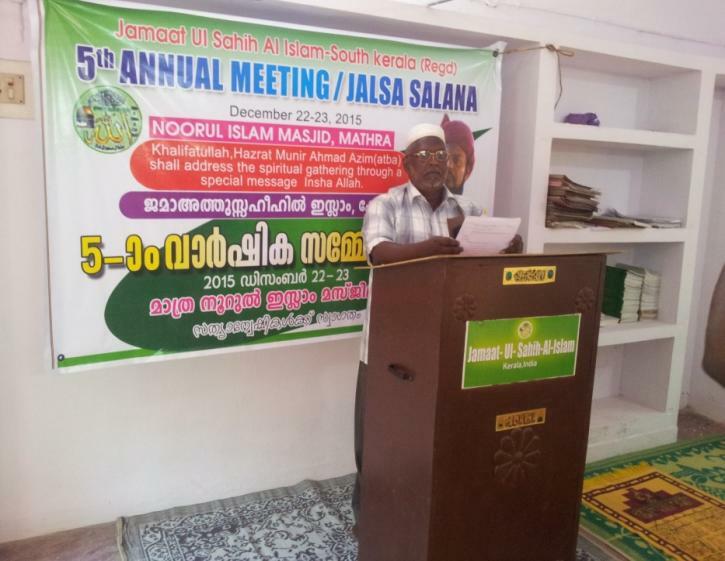 Recitation of the Holy Qur’an and Translation was done by brother Y.K.Hariz Sahib of Alappuzha. Hazrat Mukarram Fazil Jamal Sahib offered a welcome note to the gathering- pointing to the five years of progress we have had as a Jamaat in India, as followers of the Divine Manifestation of our times, first witnessed in Mauritius in the august personage of Hazrat Khalifatullah (atba) Munir Ahmad Azim Sahib in the last decade. This was followed by the recitation of a Poem by our brother Salim Sahib of Alappuzha; the poem being a Malayalam Translation of an Urdu poem originally written by the Promised Massih Hazrat Mirza Ghulam Ahmad (as) of Qadian. Like you are aware, the year 2015 is coming to a close. 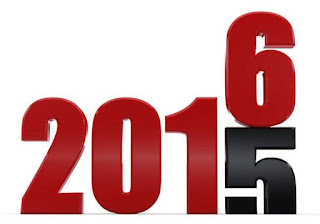 We are living the last days of the year 2015 and particularly the month of December. The month of December is also a month known as the month of festivities. Many people make therein provisions for celebrations and amusement. 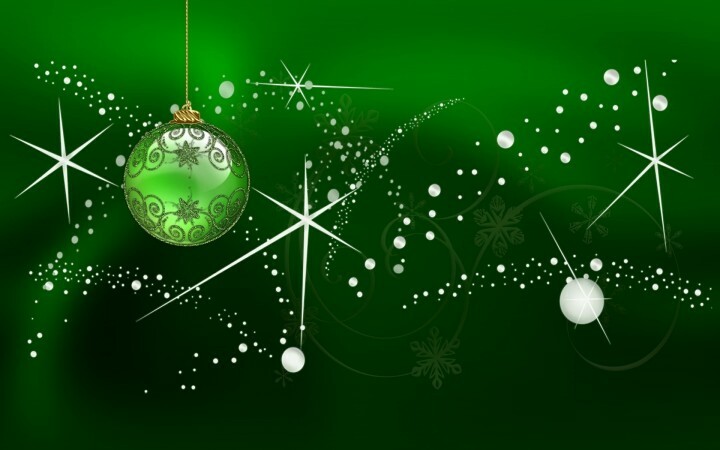 The public, private and industrial sectors which all their companies organise end of year parties and this applies also for individual family units who organise Christmas parties (today is Christmas) and end of year festivities. In such situations, a Muslim must take precautions to preserve his faith, and not to abandon the teachings of Islam and the perfect role model which Hazrat Muhammad (pbuh) represents. It is not forbidden to have lunch or dinner between friends and office colleagues, in any workplace (which is licit for a Muslim), but it is strictly forbidden for a Muslim to associate himself with illicit/forbidden things and practices. 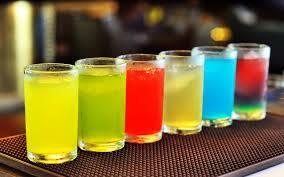 And especially in end of year parties where there is an unlimited amount of alcoholic drinks which are served. You may be tempted by friends to drink a little, to have a toast for “good health”. They may tell you: “Come on, the year is ending. Please us, and have a drink with us, to toast for good health”. And thus, to please them you forget the commandments of Allah! Do you really think that alcoholic drink shall bring you good health? Or will it destroy your health? A glass (of alcohol) will become two and shall keep on increasing, and thus there shall be no difference between you and them, for then you shall enter such a trap which shall be grievous (for you) in the eyes of Allah. Your good deeds done during a year such as: Prayers, remembrance of Allah, supplications, recitation of the Holy Quran, Fasting during the month of Ramadan, sacrifices done during that holy month, as well as blood (animal) sacrifice (Qurbani) done, shall be in vain. Also, many of our brothers and sisters did lots of sacrifices to perform the fifth pillar of Islam (Hajj). Now on a whim you prefer to burn down these good deeds with alcohol, cigarettes, fireworks and you begin to dance to their tune with all their drinking habits, singing and dancing, and thus you replace what is good, that is, acts of worship with bad things. Muslim women and girls who have a job must also take great precaution so as not to fall prey to consuming Haram (illicit) food. Do not fall prey to those vices for those vices shall lead you in a vicious circle in which you shall not be able to come out. Muslim women and girls must take precautions for in these kinds of parties, men and women mingle together and thus there is no Pardah. Ponder over this: You are barred from mosques and prayers in congregation as well as Jummah prayers, but to participate in your workplace in these kinds of end of year parties, is that not Haram for you? Is this Halal? Are those so-called Mullahs and great defenders of Islam doing nothing to protect the dignity and honour of our Muslim brothers and sisters, to stop them from falling into these kinds of traps? Very often we see parents authorising their children (boys and girls) to attend those kinds of end of year celebrations. They come back home quite late in the night and some even spend the whole night out with strangers with all their end of year amusements. They enjoy themselves so much that they go beyond limit and return back home late or remain outside without any performance of prayer etc. Indeed, where there is such amusement, there is no prayer! You were with us and You strove for us even before we do so with ourselves; also be with us since we are as You were with us even before our existence! Clothe us with Benevolence (Lutfika) and come to us with Your love (Atfika) and Your Majesty (Janaabika). Bring out of our heart the darkness of self-will and let shine in our secret (Sirr) the light of surrender to You! 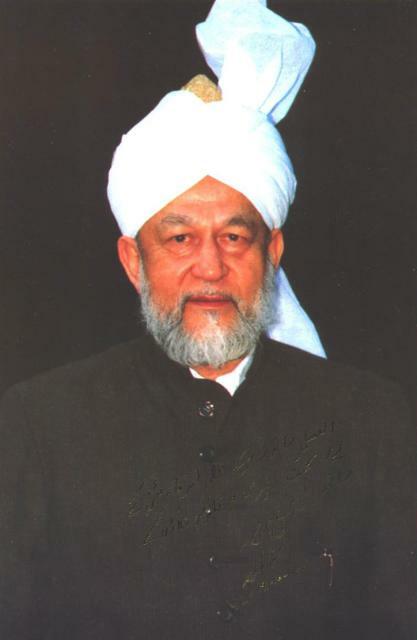 Today January 1, it’s been 15 years since the late 4th Caliph of the Ahmadiyya movement based himself on a report of hatred and jealousy of his ex so-called Amir to believe that two people were creating fitna (disorder) in the Ahmadiyya movement in Mauritius and that the system of Khilafat (Caliphate) was in danger. And then, without listening to our version mainly on divine revelation which I was receiving at the time, the fourth Caliph with such arrogance humiliated us and expelled from the Nizam-e-Jamaat (administration of the Jamaat) and in addition to that, he had not hesitated to send a curse (Lannat) on us, predicting our end. He qualified this end as a tragic and horrible end; that we would have a fearful destiny. As Allah told me afterwards, it was a Mubahila - a wish/ prayer for our misfortune and our end – which the fourth caliph had done, from the tone of his writings which he dictated through the Additional Vakilut-Tabshir Majid Tahir. In a vision (Kashf), Allah (swt) made it very clear to me that it was indeed a Mubahila which the fourth Caliph had done and I saw the Hand of Allah crush the letter (of Mubahila) in question and throw it in the dustbin. 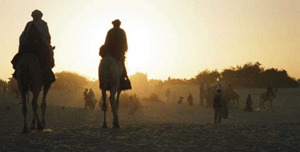 The 4th Caliph had not realized his mistake and had failed to control his ego, and then with all his arrogance, he told us to go and form our separate Jamaat, and that when two people will go this shall not make the weight against the millions of people who will join the Ahmadiyya movement. 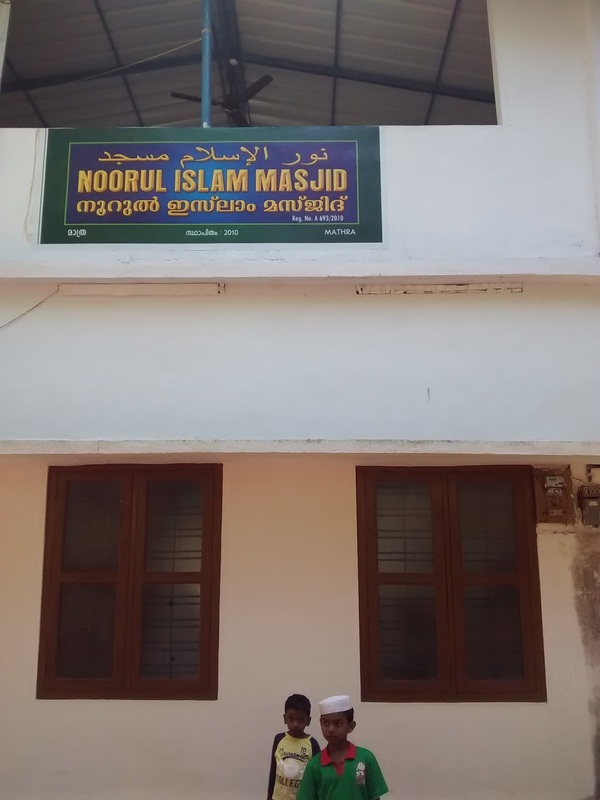 Huzur (atba) said that recently an Ahmadi told him that they (the Ahmadis of Mauritius) needed him (meaning that he is a vital asset for the Jamaat of the Promised Messiah), and to return to the Ahmadiyya Muslim Association. Huzur (atba) said that he never left the Ahmadiyya Muslim Association. It was never his wish to do so. Indeed, it was those at the head who plotted to expel him from the Jamaat, the Nizam-e-Jamaat. 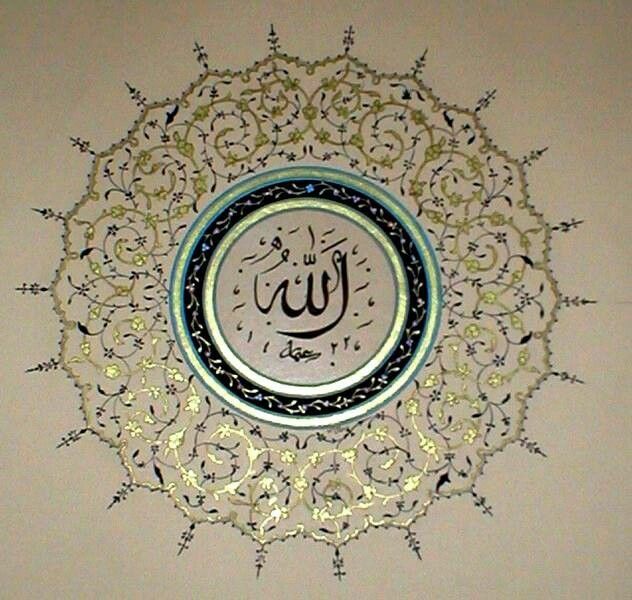 Indeed, see how the plan of Allah unfolded. The 4th Caliph “ordained” the both of them (that is, Hazrat Khalifatullah Munir A. Azim (atba) and Zafrullah Domun Saheb) to go form their own separate Jamaat. In a way, they both obeyed the Khalifat-ul-Massih; it is them who showed obedience whilst the other Ahmadis are still showing themselves disobedient. All in all, the will of Allah prevailed in all circumstances.